Lemon Patch combines a fresh summery scent – lemongrass and a hint of patchouli – with poppy seeds for a perfect all over exfoliating bar! Naturally colored with turmeric (which also happens to be great for skin!) and annatto seeds. Plus clay and charcoal were also added for their clarifying properties. Crafted with the same wonderful non-comedogenic ingredients as all my facial bars, these soaps are simply great for cleansing all skin types and don’t dry out your skin as commercial cleansers do. 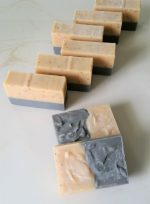 Instead your skin is gently cleaned and left moisturized from the naturally occurring glycerin present in handmade soaps! 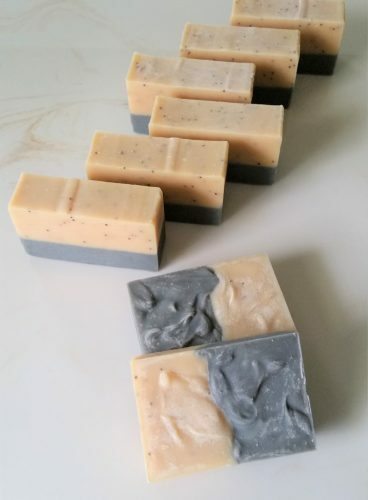 All my soaps are handcrafted in small batches with natural ingredients – food grade or organic oils and butters, essential oils (sourced from plants, never synthetic fragrances! 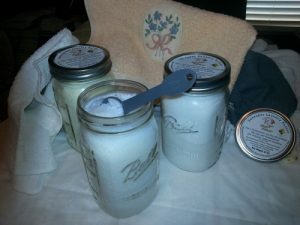 ), and clays or botanicals (used both for their own skin benefits and to naturally color soaps). Each batch is carefully formulated with sensitive skin in mind, created using the centuries old cold process method, and bars are cured a minimum of six weeks – resulting in long lasting bars mild enough for any skin type. Ingredients include saponified coconut, olive, and rice bran oils, kokum butter, safflower, castor, and apricot kernel oils, with shea butter. Also contains sea salt, turmeric, poppy seeds, cane sugar, redmond clay, annatto seed infusion, and activated charcoal. Scented with essential oils of lemongrass and patchouli. Each bar weighs approximately 4 oz.